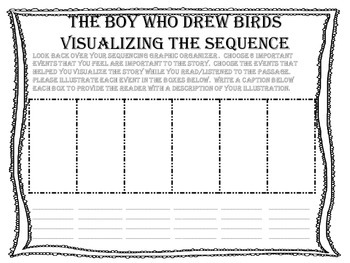 This is a sequencing activity that correlates with the McGraw Hill Wonders, story from unit 2, week 3 "The Boy Who Drew Birds". One of the skills that is focused on throughout the week is sequencing. I have created an activity that will allow students to use the sequencing organizer they used while reading the story to recreate a sequence of events from the passage. The students are asked to choose the 6 most important events from their organizers to create their visualization presentation. They are asked to include captions under each of their illustrations to provide their reader with details from the text to show how their visualization related to the text. I plan on using this with my students after we have finished reading the entire story. I believe this will help make the sequencing skills we focused on throughout the lesson concrete while emphasizing the importance of creating visual pictures in our minds while we read. I also believe my 5th graders will enjoy creating illustrations to go along with their captions! What a fun way to make our learning permanent! I have other products that correlate with this story as well as a bundle that includes everything from lesson plans, vocabulary organizers and activites to text dependent questions. If you are interested, please feel free to look at my other products. Thank you for considering my products! Don't forget to leave feedback if you enjoy using my products in your classroom! THANKS!